Employees will only deliver excellent work results if they like their job, their tasks and their whole work environment. That is a truism, and one with which we are all familiar. 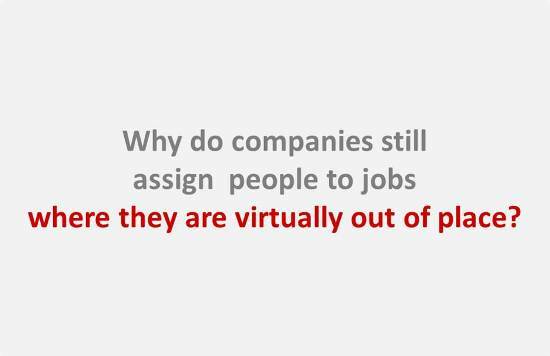 So it is all the more surprising that there are still people assigned to jobs where they are virtually out of place. Modern tools for personnel management, planning and development should prevent such mistakes. However, especially in reorganization and restructuring phases there are still employees ending up in a job they would never choose on their own. I once had the doubtful pleasure of working in a company that went though a complete reorganization after a severe corporate crisis. We all knew that many jobs would be lost. Boss: „Congratulations, you are still onboard. You will work in the credit department where you will make lending decisions. I started to look for a new job right at the same evening. Luckily, I found another job within the company that I liked much more. A colleague of mine shared a similar fate during that reorganization. The colleague had an IT-background. That’s why somebody thought he could take on responsibility for the tool used in sales department for loan calculations. They hoped he would become some sort of quantitative analyst. Unfortunately, not everybody who ever worked in IT is experienced in Excel and has an interest in sales. The guy gave in to his fate an accepted the job in the sales department. There, he endured three sad years. He never came to like his new job. Thus, it was not surprising that he never did a really good job. His colleagues there continued to consider the calculation tool as a less-than-ideal solution. They never really trusted its results. Here is an employee. There is a vacant position. If we think for long enough, we will come up with some explanation why both may fit together. Finally, the employer has the right to give instructions, hasn’t he? Thus, the employee is obliged to be happy about his new job and to deliver excellent results there. I fully understand that businesses can’t create the perfect dream job for all their employees. However, I would expect at least some empathy and thinking about the employees’ preferences. People will always spread the word about badly assigned posts. This will be counter-productive to any internal communication initiative about the great new corporate vision (which probably includes something like “We value our employees”). Employees who find themselves on an unwanted position will develop various strategies to cope with that situation. Some will immediately start to look out for something new on the job market. Others will try to adjust to their unloved work, trying not to stand out in a negative way. They will suffer in silence. Both options are not beneficial to the business. Would you leave immediately or would you stay and hope for better times? Due to high rate of unemployment, you better stay and hope for the best, but the best strategy is to developed yourself through improving your Cvs through educations and training to give you that better avenue which you can apply for promotion or that job you like.